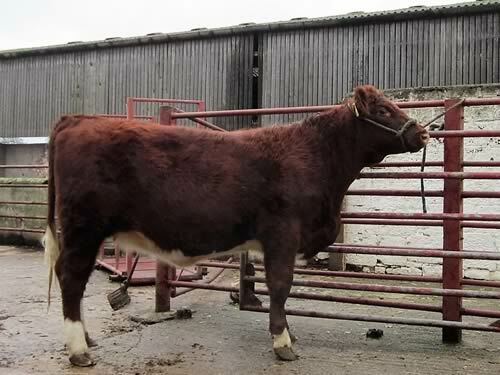 We have five very useful unserved heifers entered for the Skipton Sale on Wednesday 7th November. Lot 33 is Shawhill Lilian (643847256), a Burnside Elite daughter descended from our very successful show cow, Fieldhouse Florence Anita. Lot 36, Shawhill Dee Lulu (643847257) is also by Burnside Elite who we purchased some years ago as the top price Stirling Bull at 9,500gns. Lot 37, Shawhill Dewdrop Lizzy (643847258) and lot 38, Shawhill Liana (643847259) are both by our very successful Canadian bred bull, Shawhill Freedom, with the former having a double cross of this breeding. 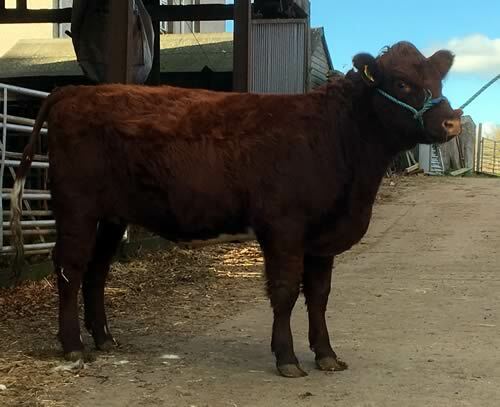 The youngest heifer, lot 51, Shawhill Dee Lily (643847266) is, again, by Burnside Elite and her dam is a twin to the dam of lot 36, both these dams go back to the Glenisla Zetor sired, Connor of Upsall. 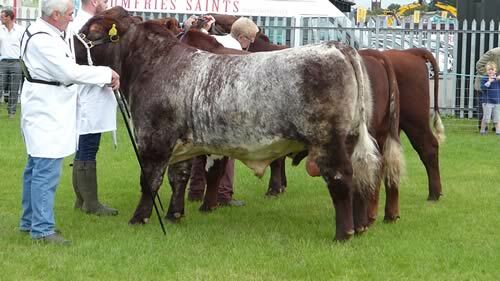 Connor of Upsall also features extensively in the same day's catalogue of the dispersal of the Newfield Beef Shorthorn herd. 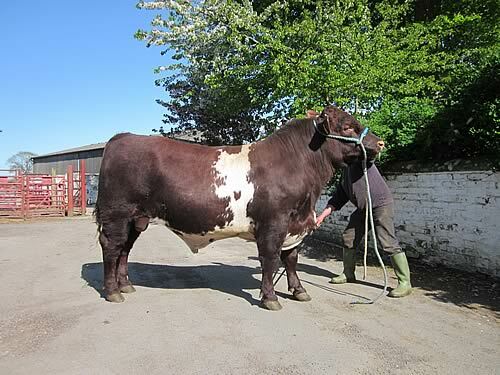 We had bought Connor as a calf at foot at the Upsall Centenary Sale and Mr Abrahams purchased him from us and he went on to success at the Great Yorkshire Show. 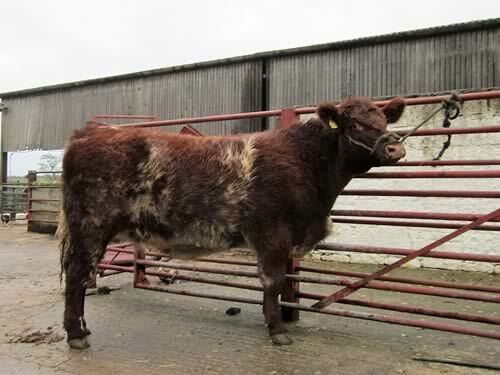 Lot 120 in the dispersal catalogue is a Shawhill bred heifer. Our bull Shawhill Leroy took the male Beef Shorthorn Championship at the Stirling Bull Sales and, after spirited bidding in the ring, he sold for 12,000 guineas to Duncan Welsh for his Westbroad Beef Shorthorn Herd at Fenwick. 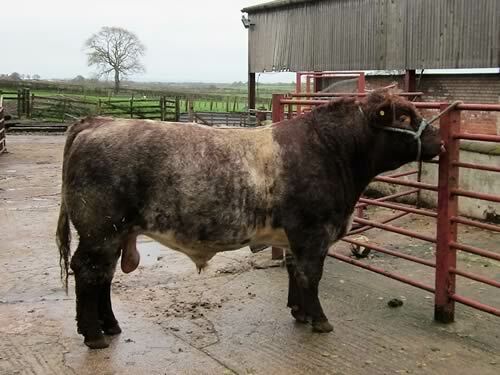 This is the second Shawhill bull that Duncan has bought, he purchased Shawhill J-A-T from us, also at Stirling, a couple of years ago. We wish him every success with his purchase. 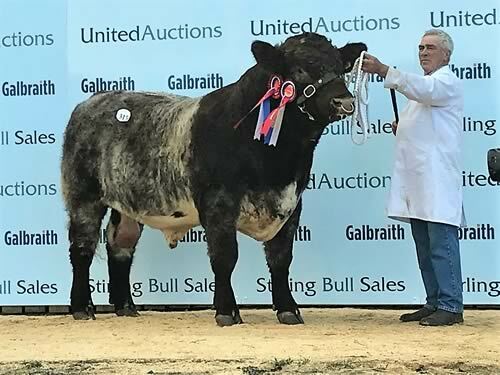 Leroy was top-priced Beef Shorthorn at the sale and this is the highest price that we have achieved for a bull to date. The Shawhill bulling heifers at the sale sold to 3,000 guineas and averaged £2,310 for three sold. 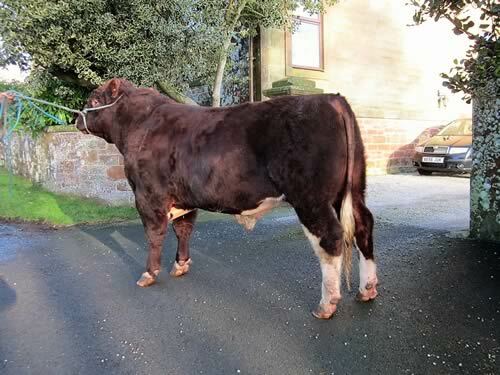 We have four unserved heifers and our bull, Shawhill Leroy, going to the Stirling Sales on Monday 22nd October. Leroy, a 19 months old roan poll bull, was champion at both Agri-Expo and Stars of the Future in 2017 and took a 2nd at this year's Great Yorkshire followed by the championship at Dumfries Show. Hopefully prospective buyers will find him well worth a look. His breeding goes back through K-Kim Freedom and Braebank Dewdrop on both sides and his dam is a big good cow by the high-index Glenisla Zetor. Our consignment of poll heifers are an interesting group including the March born, Shawhill Beatrice Lottie (by Shawhill Henderson). 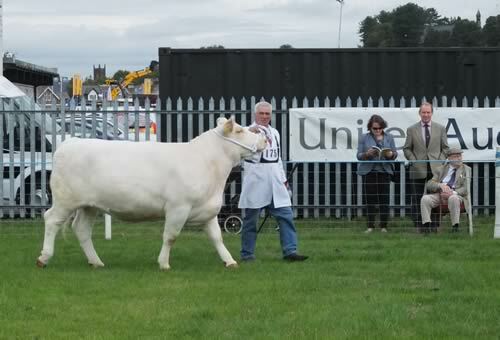 She has been seen at the Summer Shows including 5th in class at the Great Yorkshire. The others are April born and comprise Shawhill Lavender and Shawhill Lavina, both by the all-Canadian Shawhill Freedom, and Shawhill Foxglove Linnet. 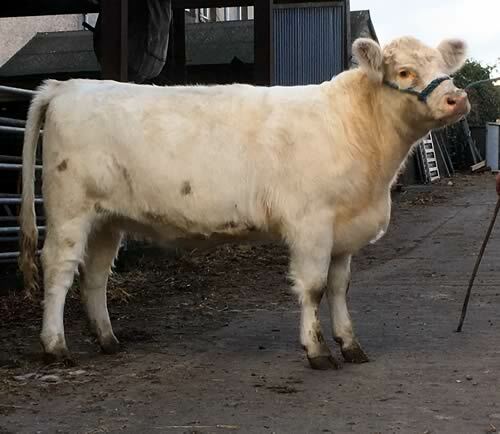 She is sired by Burnside Elite, top priced bull at Stirling some years ago, and goes back to LS Arctic and the Lowther Foxglove family on her dam's side. 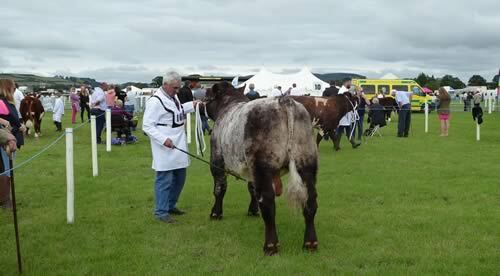 A nice show of Beef Shorthorns at our local Dumfries and Lockerbie Show. Shawhill Leroy followed up on previous successes and took the Shorthorn Championship. 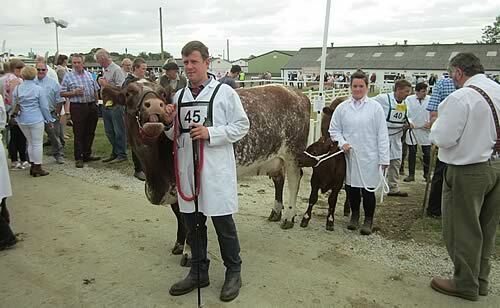 Our heifer and calf, Shawhill Lady Jessica was placed second to David & Rosemary Dickie's cow in their class. Our white heifer, Shawhill Rosebud Kool was third in the senior heifer class and Shawhill Beatrice Lottie came second in the junior heifer class. 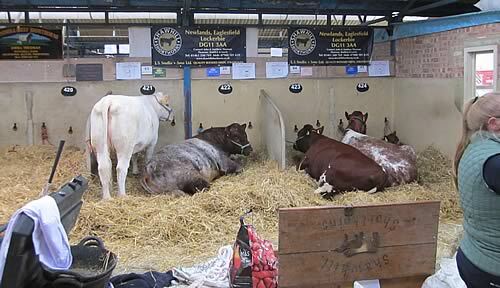 We had the usual enjoyable visit to the Great Yorkshire Show. Well looked after and excellent weather, maybe too excellent! 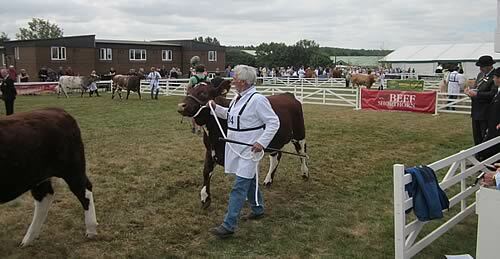 We took four entries and each got a ticket in what was a really good show of Beef Shorthorn cattle. A great advert for the breed. 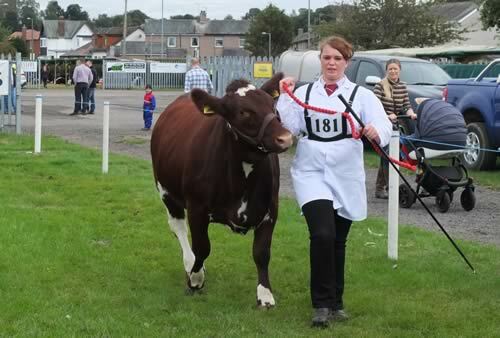 Our young bull, Shawhill Leroy (by Shawhill Henderson), who was much admired at last years calf shows took a 2nd as did our very promising heifer, Shawhill Lady Jessica with her Diamond Lord Belmore calf at foot. 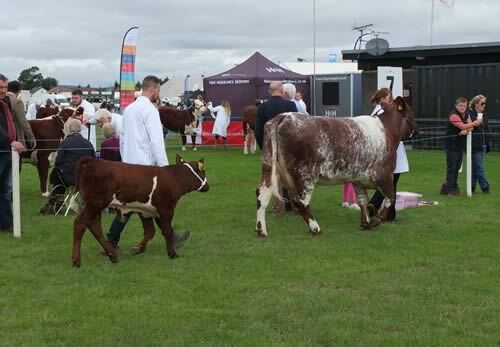 The maiden heifers Shawhill Rosebud Kool (white, by Shawhill Freedom) and Shawhill Beatrice Lottie (by Shawhill Freedom) took 4th and 5th in their respective classes. 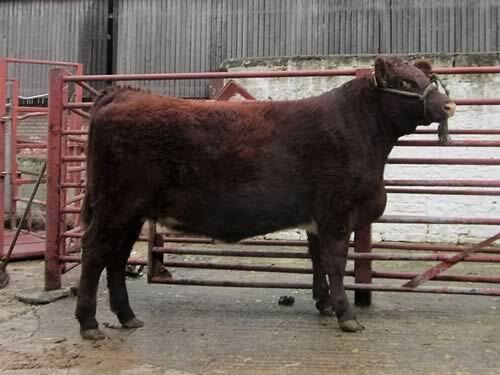 We have a quality Shawhill Henderson son, Shawhill Kenco (H) (633802061) going to the Carlisle sale on Friday 25th May. 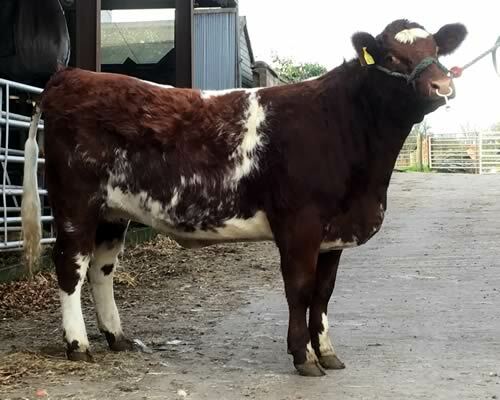 He was born March 2016 and is lot 403 (third in the Shorthorn ring). 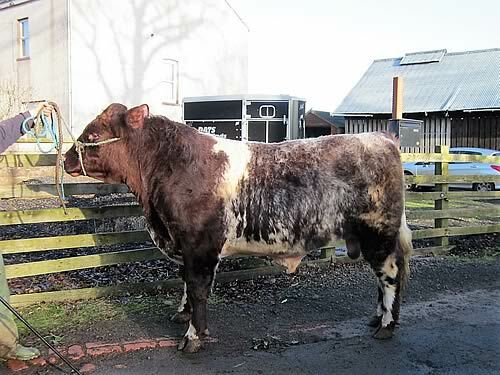 His dam was a particularly good cow, Glenisla Eva Broadhooks by Glenisla Chieftain. He was best Beef Shorthorn bull at Borderway Agriexpo, 2016 and has useful figures. We have used him and he certainly has the potential to be a good breeding sire for any herd. At last we are getting our cows out. 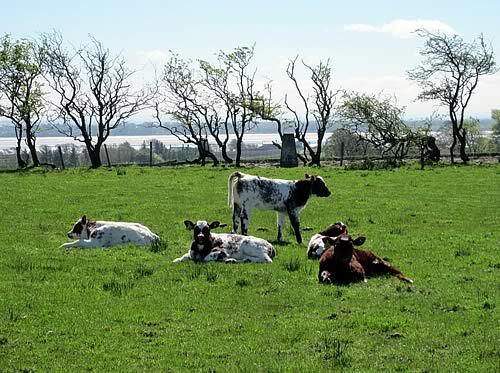 This group of late April born calves are enjoying the sunshine at Annan. Three of these are ET calves, the red one is a Canadian heifer by Little Cedar Aviator 503X out of Braebank Dewdrop 35N. 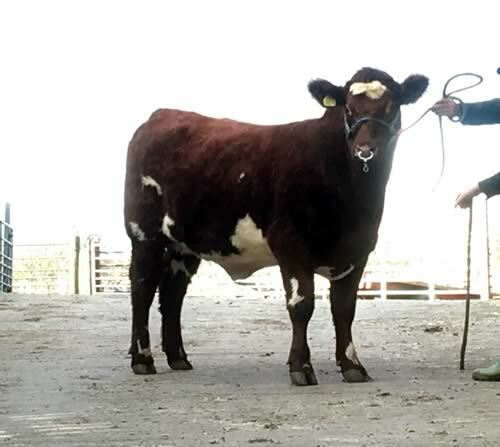 The Show and Sale of store cattle at Longtown Mart on Tuesday 8th May incorporated an inaugural special show of Beef Shorthorn and Beef Shorthorn cross store cattle, sponsored by Morrisons and supported by the Beef Shorthorn Cattle Society. 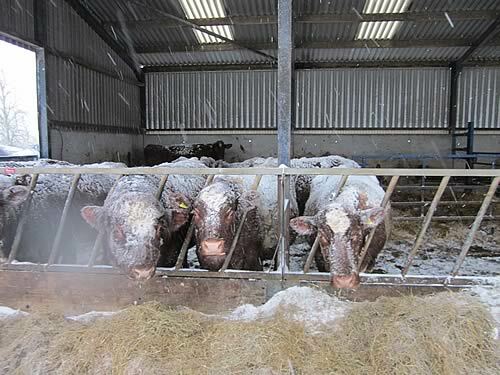 Over 60 Shorthorn stores were forward from twelve consignors from throughout the area and from as far afield as Darlington. The judge, Mr J. Marshall selected a pen from J.E. & B.L Goddard, Frankstown as champion pen and a bullock from Brian Irving, Harper Hill as champion single animal. Mr Irving also took second prize in the singles class. 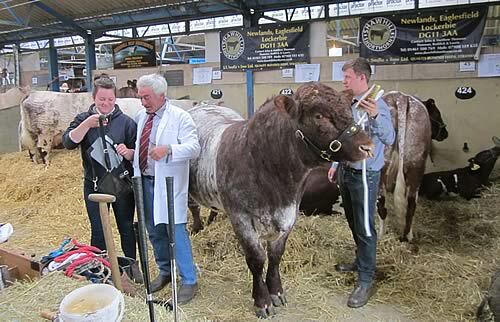 Messrs Goddard's cattle sold to a top of £1,120 to H. Alder & Son, West White Hill, Northumberland with their prizewinning pen at £1,050 to Mr J. Barr, Greenfield Muir, Renfrewshire. Mr Irving's champion realised £1,060 with his second prizewinner at £1,040. Both went to Castletown Estate, Carlisle. Others sold to £940, £890 & £840, High House, Brafferton; £930 & £880, Frankstown; £900 & £850, Farlam Hill; £860, Halldykes; £830, Penpeugh; £820, Pilmuir; £800, Williamwood. Best individual – 1st Harper Hill, 2nd Harper Hill, 3rd Frankstown. Best pen – 1st Frankstown, 2nd Pilmuir, 3rd Sandwick. 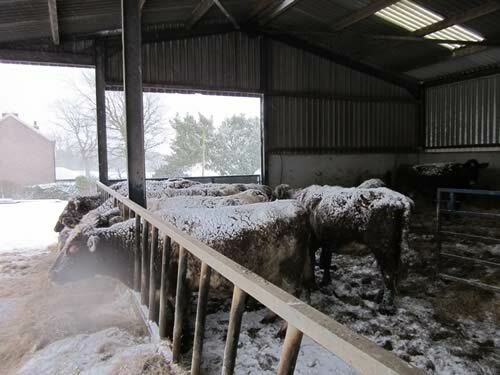 It has been what seems like a very long winter with our cows inside since 1st September last. 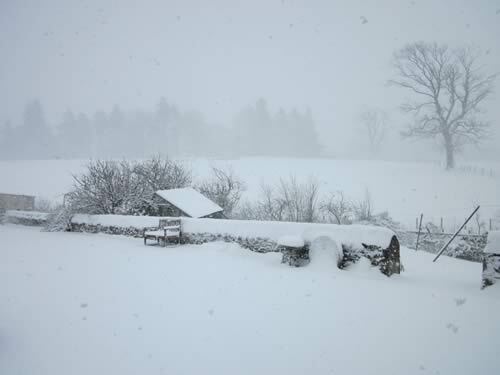 Some heavy snowstorms, as can be seen from these images. Fodder will be scarce for everyone in the north and Scotland. Our own lambings are not proving too bad although we had some heavy losses on the very bad days. Everyone will not be able to say the same though and there will be less sheep around this coming year. 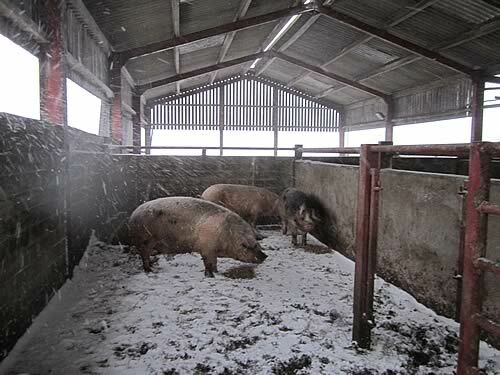 Fortunately the prices of prime hoggs, cull ewes and store sheep through our marts at Longtown and Dumfries, and elsewhere, are proving to be way above expectations. 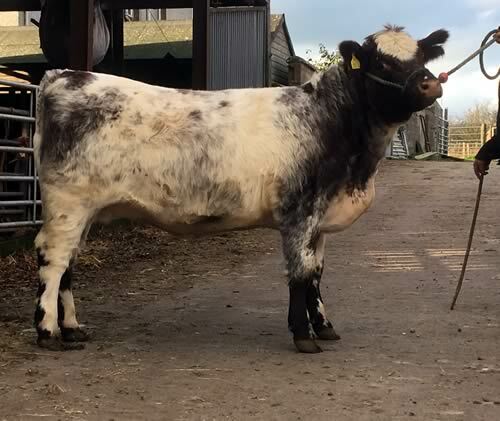 We have two good April born poll sons of Shawhill Freedom going to the Stirling Beef Shorthorn Sales on Monday 5th February. Shawhill Freedom, our successful all-Canadian herd sire is by K-Kim Freedom out of Rolly Bateman's famous cow, Braebank Dewdrop. 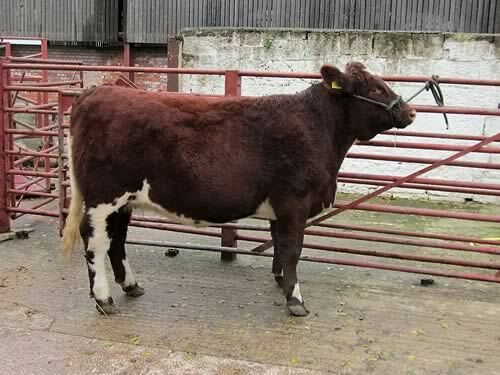 Lot 245 is a strong and well made roan bull, Shawhill Kalamazoo (P). Born on 10th April 2106, he is by Freedom out of a good daughter of the Dunsyre North Star sired bull, Albion Anniversaire. Shawhill Kingsman (P) is lot 255 and was born on 23rd April 2016. Again by Freedom, his dam is the best of our foundation cows, Upsall Ury Maid X453. Bought at the Upsall Centenary Sale and still going strong, she goes back to Uppermill Recto. Kingsman is an impressive well grown red bull with, we think, masses of potential.